With summer and fall behind us, we’re heading into gala and party season. And that means getting glammed up with shiny evening dresses and make-up. Here’s some tips on making your eyes stand out - one of the first things people will notice about you. Long lush eyelashes can make your eyes pop. So how do you get them? We’re all aware of how aging impacts the skin, but did you know that aging can also affect your eyelashes? As we age, lashes can become thinner, shorter and lighter, beginning in our 20s and 30s. Enter LATISSE, a once-a-day treatment you apply topically to the base of your upper eyelashes, and only available through your physician or at medical spas. Gradually, the results come in. More length may start appearing in as little as 4 weeks, with full growth achieved in 16 weeks. Perfect timing for the upcoming party season! To make the most of your longer, lusher lashes, add a denser looking lash-line by lifting the area under the brow up and outward, then close your eye, exposing the lash line. Then, with these tricks from Scott Patric - ‘etch it along, don’t draw a continuous line, using short strokes, all the while pushing the eye pencil in between your lashes at the root.” Replace black eyeliner, which can look harsh, with a dark grey or espresso shade. Avoid under eye liner as it emphasizes dark circles. Now that you’ve got gorgeous lashes, finish the look off. To get an instant wide awake look, place some light cream shadow on the inner corner of the eye. Apply concealer under the eyes after eyeshadow and mascara. As your Calgary eyelash growth clinic, Britannia Dermedics is proud to offer LATISSE to our clients. Latisse is prescribed for hypotrichosis, a deficit in eyelashes, or short lashes. With application, Latisse gradually increases the length and thickness of your lashes. If Latisse is right for you, it can dramatically improve the appearance of your lashes with striking results. Latisse is for those with sparse, short, or low lash counts. It is ideal for anyone who likes to wear mascara to draw attention to the eyes, but has an active lifestyle, and wearing mascara regularly is a huge, messy fuss. Latisse is applied from a dropper. It works by increasing the growth cycle of your eyelashes on the top lash line, extending this cycle and producing more, longer, and darker lashes. Latisse is safe to use; it is the only FDA approved eyelash growth treatment. As is true for all products that you use on your skin or in your body, all ingredients should be checked to make sure there are no allergies. Latisse should not be used on your bottom lash line; it also does not need to be used on your bottom lash line to achieve a dramatically different look. Latisse is, like other treatments at Britannia Dermedics, a non-surgical and non-invasive program. Your eyes are such a beautiful and fascinating part of your face, and Latisse can dramatically improve their bright appearance without permanent or painful changes. It’s party time — the next six weeks for many of us are filled with galas and holiday events. With all these events coming up, it’s time to think about putting together a glamourous look from head to toe, including your eyes. Beautiful lush thick lashes are a must have accessory to make your eyes pop. As we age, eyelashes also change, along with our skin. 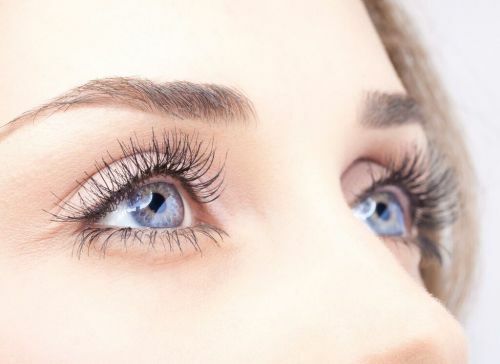 Starting in our 20s and 30s, lashes may become shorter, thinner and lighter. Perfect for the upcoming holiday season, LATISSE is a once-a-day treatment to be applied topically to the base of paper lashes. It’s available only through a physician or at a medical spa. Your eyelashes will appear longer in as little as four weeks, with full growth achieved by 16 weeks. Make the most of your longer lashes by adding a thicker lash-line with an eyeliner pencil. Lift the area under the brow upwards and outwards, then close your eye to expose the lash line. With short, small etching strokes, push the eye pencil in between lashes at the root — don’t draw a continuous line. Instead of harsh looking black eyeliner, try a shade in espresso or dark grey. If you have dark circles under your eyes, don’t use liner on your lower lash line as it will emphasize the circles. Finish the look off with an instant wide awake look. Apply a light cream shadow or highlighter on the inner corner of the eye. If needed, apply concealer under the eyes after eyeshadow and mascara.